It was so thick you could use it as icing on a cake. I was a little embarrassed and very disappointed. The dark chocolate flavour was definately there but it wasn’t light and fluffy like I was expecting. 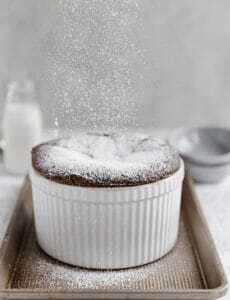 Would this recipe work for a chocolate trifle? 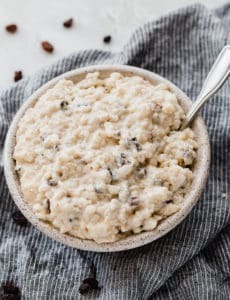 I have a few recipes that call for mousse and this sounds sooo good but I don’t know if it would hold up. I would so prefer this to pudding. Thank you. Absolute beaut recipe…lovely light mousse.I used bournville chocolate which worked brilliantly…not too strong. Hi, im gonna make this today and was just wondering about how many teaspoons/tablespoons I need to substitute the brandy for vanilla extract? Also, is the plastic wrap supposed to touch the “skin of the mousse” before putting it in the refrigerator? It can, but it’s not necessary. 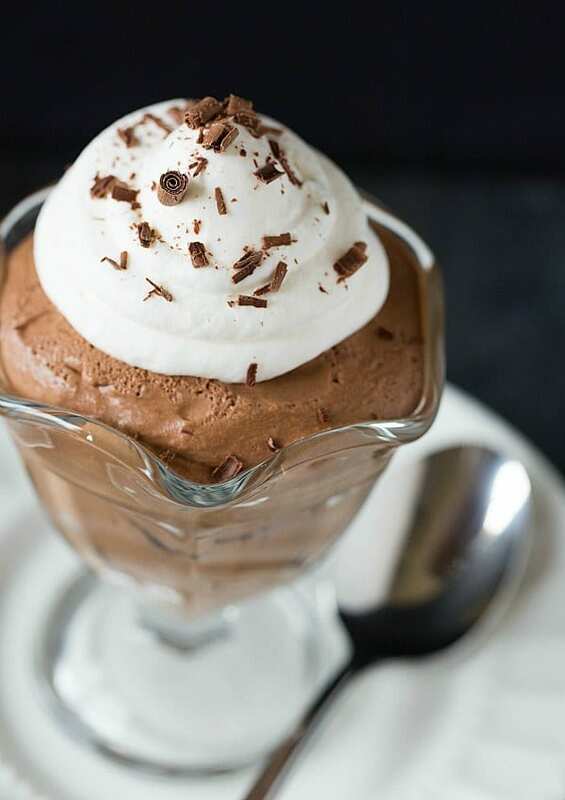 This was the first mousse I’ve ever made, and oh my GOSH, this is the deep, chocolatey flavor I’ve been looking for in a dessert! I didn’t have brandy, so just omitted it. Two things I wanted to share, if anyone has these issues. My heavy cream did not whip up right away, so if yours doesn’t either, just keep going – mine took 6 or 7 minutes. Also, you can find the espresso powder in the Mexican food section, at least in my local chain supermarket. Thank you so much for this recipe, it totally satisfies my never-ending chocolate craving! i made your mousse and it turned out great. Used raspberry chambord and it tasted heavenly. Thank you and all my guests thank you. this seems absolutely brilliant, but I was wondering what could be a substitute for the brandy? You can omit the brandy without a problem, no need to substitute. 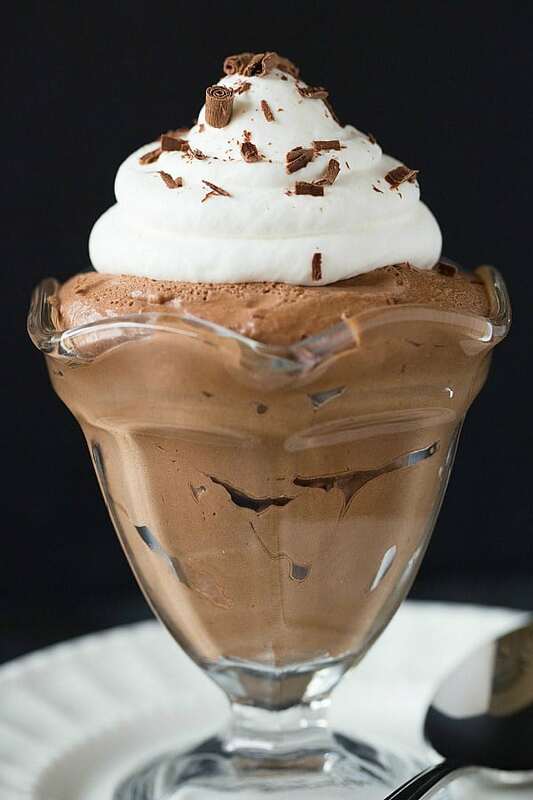 When I arrived in Belgium, I had this recipe from my sister – in – law: 4 eggs, 4 bars of chocolate, 4 spoons of icing Sugar … liqour ( optional ) … I have made my chocolate mousses for more tha twenty years only with this recipe! It is so cute how the recipe says 6 to 8 servings! It is 2 servings if my husband is at home and 1 serving if he isn’t! 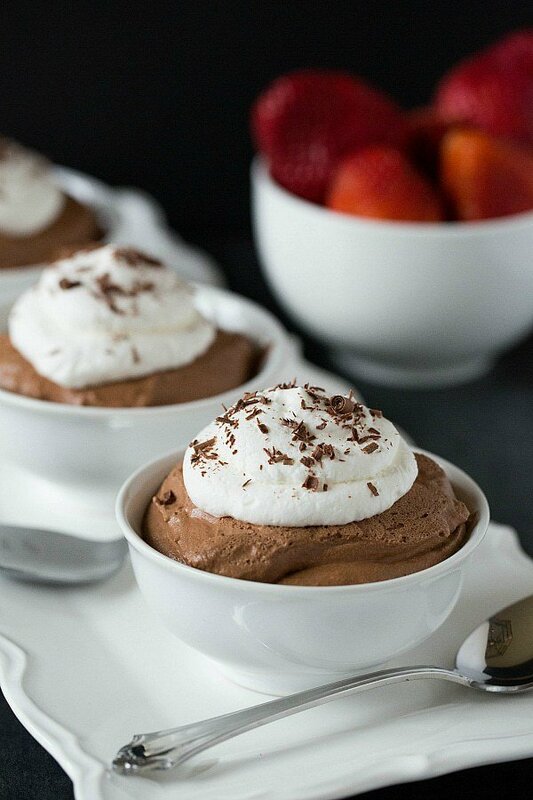 Chocolate Mousse is absolutely my favorite dessert! Hi Abigail, You can just omit the espresso powder, you don’t need to substitute anything. This looks so delicious! I really want to make it for christmas eve and I’m wondering how big one serving is – is the bowl shown in your pics one? I don’t want to have too much chocolate mousse (if thats even possible) ;D Never made it before so I’m excited for my first try! Hi Anna, A serving is really as much as you want :) But yes, one of those small bowls would probably be indicative of a normal serving size. Thanks for your reply! (Even though it was a bit too late – I had already made the mousse when I got the email). I divided the whole batch between 7 people and it was quite a lot. At first it didn’t look like much but it was super rich and everyone agreed that half as much would have been enough as a dessert. But my whole family loved it and all the bowls were empty :D The mousse was really easy to make and tasted just like in a fancy restaurant! Help! I’m in the grocery store aisle trying to buy all the ingredients to make this fab dessert! Is “Instant Expresso” the same as “Instant Expresso Coffee”? And Dutch Process Cocoa Powder…I can’t seem to find it. Is there a certain brand? Is it different from naturally unsweetened Cocoa powder (by Hershey, Nestle, Ghiradelli, etc)? Thanks!! Hi Jessica, I’m not sure if the instant coffee would be the same. Instant espresso powder is extremely fine, which makes it dissolve very easily into liquids. There are a lot of brands of Dutch process cocoa powder; it is different from natural unsweetened cocoa powder. I typically do not buy it at the grocery store; you can get it on Amazon, from King Arthur Flour, Penzeys, etc. Enjoyed making this and it turned out perfect..thank you for sharing. I’m looking to do your mousse recipe for a white chocolate mousse, would you have a recipe for that? 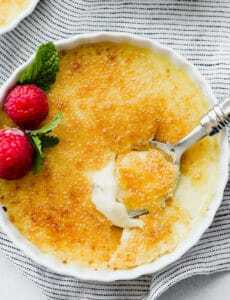 Hi Maggie, Unfortunately, I haven’t done a white chocolate mousse, I need to add it to my list! Where did you get those? So cute. 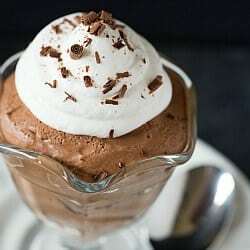 The chocolate mousse is on my menu soon. Once it sets do you think it could be piped? I made the little chocolate bowls from the Wilton molds and wanted to see if I could pipe the set mouse I to them. Thanks! Hi Danielle, Yes, I think this could be piped for sure. Sounds like a pretty presentation! I made this mousse for dessert for our friends last night at our monthly dinner get together. It was a hit! Everyone loved it. I added a fancy little wafer and caramel cookie in each ramekin wit it and it looked very “fancy restaurant” as my best friend said. I’m so glad I made it. Is it possible to substitute the bittersweet chocolate with semi-sweet or milk chocolate? 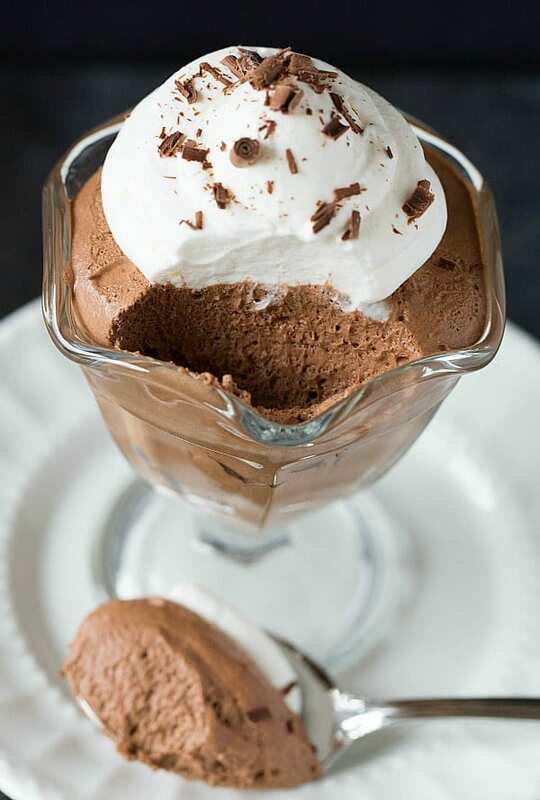 I am making this mousse for my sister but she prefers milk chocolate. What alterations do you recommend? Thank you. Hi Michelle, thank you so much for the recipe. I tried it out yesterday and my sister really liked it. It had the perfect consistency she was looking for. I appreciate your time in replying to me and look forward to trying more of your recipes! What does seperated eggs mean?? Like seperating the yolk from the whites?? Hi Noelle, Yes, the yolk separated from the white. I made this for New Year’s Eve and it is delicious. I substituted amaretto for brandy. The texture was perfect! I was really surprised that it was so easy to make. I think this is one of those recipes that you can dress up or down. If you wanted, it would be the perfect dessert for a fancy dinner, but you can keep it really simple too. It’s definitely a recipe that I’ll keep bookmarked. How would one substitute the liquid eggs, since the recipe calls for the eggs to be separated? Also, do pasteurized eggs whip well? Pregnant but now I REALLY want to try this recipe!!! Heyy!! This looks fabulous! !! And I want to try it as soon as possible but first I want to ask you, is there a substitution for the Brandy? Or can I completely ommit it?? Thanks sooo Much! Hi Judi, You could just omit the brandy. Do you recommend a specific brand of brandy? Hi Samantha, No, whatever brand you buy is fine. Oh, and since I didn’t have any espresso powder on hand, I just left it out, hoping it would be fine without it. And I was relieved to read the comment where you said it’s okay to omit it! I just made it for my brother’s birthday, and it is setting right now; can’t wait to try it cause it looks delicious!! Thank you for the great recipe. I’ll let you know how it turns out! Could the brandy be substituted with rum or chocolate(or mint) liquor? The only brandy I could afford to get right now would definitely clash with the semi sweet chocolate, however I do have some rum and flavored liquors I wouldn’t mind putting to use for this. Any thoughts? Thank you in advance for any advice and for sharing your recipe!